Changing Climate May Have Led To Earliest Mummies South America's Chinchorro people lived in an extremely dry desert region where the dead turned into mummies naturally. But at some point, they stopped leaving the process to nature. Now, scientists say the Chinchorros began mummifying their dead as their climate grew wetter. A couple of thousand years before the Egyptians preserved some of their dead, a much simpler society made the first known mummies. The Chinchorros, the first mummy makers, lived about 7,000 years ago in South America, on the coast near the border between modern-day Peru and Chile. 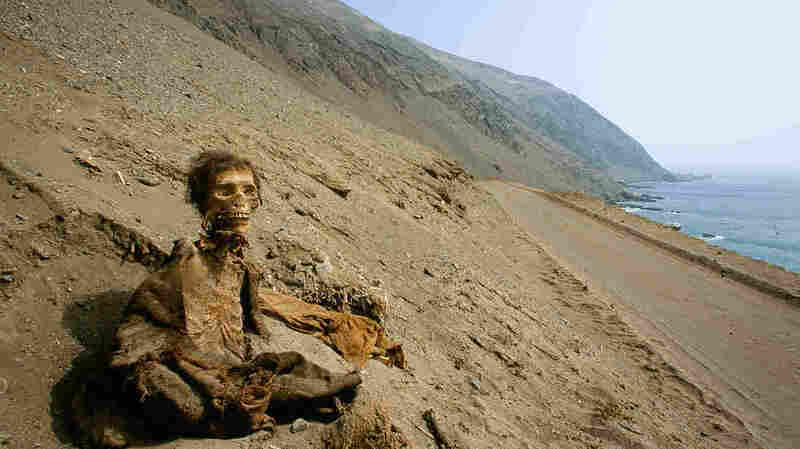 The desert area where they lived was so dry, dead people turned into mummies naturally. "Once you die, you stay around," says Chilean ecologist Pablo Marquet, who studies the Chinchorros and the area where they lived. "You don't disappear because of the decomposition that happens in many other environments." At some point, the Chinchorros stopped leaving it to nature, and began mummifying their dead. They started dressing them up with wigs, clay and paint. A few years ago, Marquet joined archaeologists and paleoanthropologists to answer that central question. If you have more individuals in a population and they start interacting, it is more likely that new ideas will emerge, and once new ideas emerge they will spread faster. What they did know was that the early Chinchorros were hunter-gatherers. They did bury their dead, but in shallow graves only about a foot or two from the surface. It took only a little erosion for these dead people to be revealed. "[In] most other populations, the dead disappear and become recycled back into the system," Marquet says, "but here they stay around." The living also encountered the dead when they dug new graves. Diseases and arsenic poisoning from drinking water were rampant, adding up to a lot of corpses on the landscape. In fact, Marquet and his team calculated that the average person would encounter these natural mummies at least hundreds of times in a lifetime. "The question was why they started to mummify their dead, and I think the key insight came from the observation of their environment," Marquet says. He says he thinks seeing all these mummies inspired the Chinchorros' death rituals. His team also looked at data about the climate thousands of years ago. "We started seeing the data, and everything was like aligning perfectly," he says. "We couldn't believe it." According to the data, it appears the Chinchorros started preserving and decorating corpses during a time their climate was wetter. There would be more water and more seafood around to support a bigger population. Artifacts from that era confirm that the population surged around this time. "If you have more individuals in a population and they start interacting, it is more likely that new ideas will emerge, and once new ideas emerge they will spread faster," Marquet says. The idea is that the more hospitable environment gave people more free time. They no longer needed all their time for hunting and gathering. They had time to care for their dead and to pass on their embalming techniques to others. These mummies haven't revealed all their secrets yet. Researchers are still trying to explain why infants and fetuses were among the South American mummies; other cultures reserved this treatment for their elite.